At Bolder Advocacy, we are lawyers, coaches and nonprofit experts with one big goal: to make advocacy easy and accessible for you, the nonprofit and foundation leaders who want to be great fighters for your cause. We believe it’s vital for nonprofits to make their case to elected officials and the public so their priorities will get the attention and resources they deserve. We understand the rules that govern nonprofits’ ability to advocate, as well as the wide range of advocacy options that are open to you. And because we want to share that knowledge with you, we dedicate ourselves to offering tools, training and resources to nonprofits that want to become better advocates. 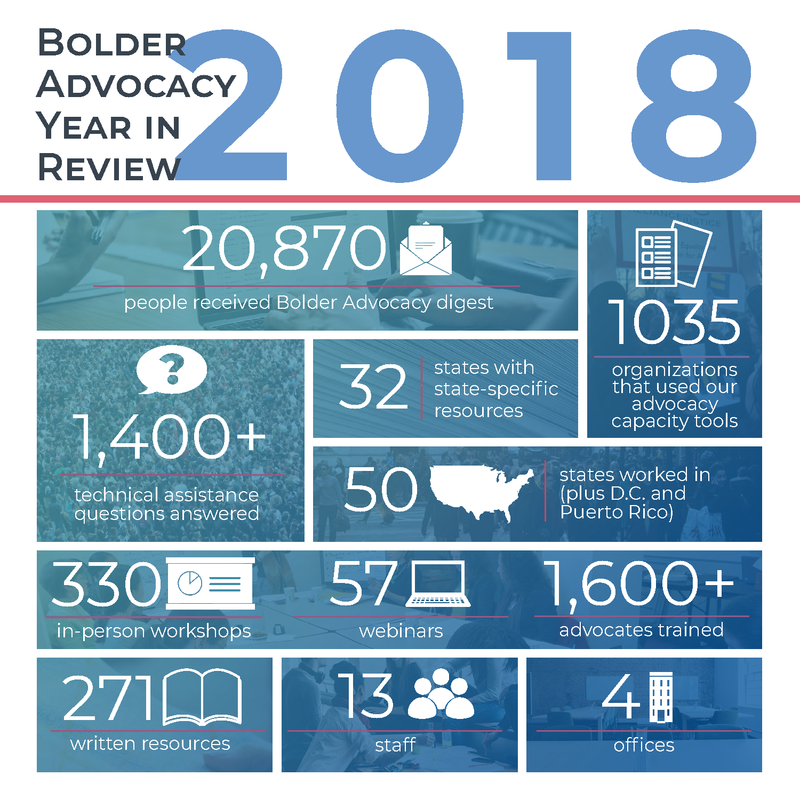 Bolder Advocacy is a program of the Alliance for Justice – a national association of 130 organizations that are united by a commitment to a fair, just, and free America where everyone has equal access to justice and can fully participate in our democracy. To learn more about our work on justice issues, visit the AFJ website. Knowledge is power, and Bolder Advocacy equips nonprofits with the knowledge they need to be confident and powerful advocates. Our staff attorneys conduct workshops and trainings around the country and one-on-one technical assistance by phone and email. Our coaching helps nonprofit leaders become stronger advocates for their missions and empowers them to speak up. In addition to our trainings, Bolder Advocacy provides nonprofits and foundations with accessible information, resources and tools to help them navigate complex advocacy rules and regulations. Our website is a place where users can search our robust collection of how-to’s, fact sheets, and reports, as well as connect with a coach for one-on-one technical assistance. The site provides examples of how nonprofits have used advocacy to advance their causes, and offers easy-to-use tools that help nonprofits measure and develop their ability to advocate. Bolder Advocacy is also an advocate for you, the leaders and staff of the nonprofit and foundation world. We fight for nonprofits’ right to play a role in influencing public policy. That means keeping a watchful eye on legislation and other policies that affect nonprofit advocacy. When policies threaten nonprofits’ rights, we weigh in against them. When policies benefit nonprofits, we make our voices heard in support. We also speak out for the nonprofit sector year-round, day in and day out. Our goal is to build a steady drumbeat that supports nonprofits’ right to take part in activities that influence public policy. Bolder Advocacy is currently accepting applications for Spring 2019 interns. Click here to learn more and apply today. The Bolder Advocacy team works across the country to guide you and your organization through the intricacies of advocacy, to help you understand what’s allowable under the law, to build confidence, and to give you the tools you need to conduct effective advocacy. Our commitment to supporting nonprofits and foundations does not stop at providing resources and information on advocacy. Read about our involvement in legislative and regulatory efforts. Learn more. To maximize our impact and benefit from the perspectives and abilities of different groups, AFJ often collaborates with others in pursuit of common goals. Learn more.